Shizukashi, home to many different races. People may look different but that doesn't matter. 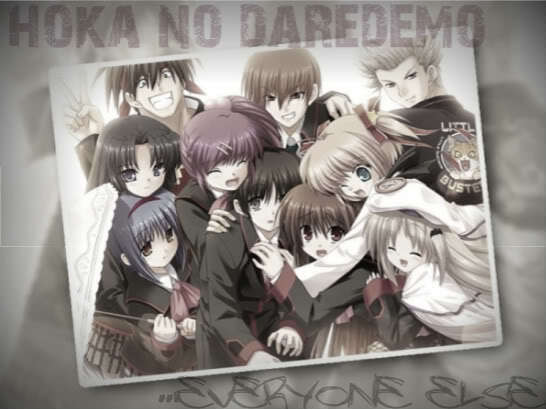 What matters is 'Hoka no daredemo' -Everyone else. Personality: Yasu is a bit of a space head and ditsy. She never seems to know what's going on. However she despises fighting and always works hard to make people happy, even if she ends up over-doing it. Bio/History:Born in the quiet town of shetland U.K.,he found out about his powers early on.discovering his ability to fly and lust for blood at the same time.He is a junior in high-school. Personality: Dai is very sarcastic, cocky, arrogant, and smug, at first appearing to have the whole world on strings. Once you get to know him, though, you realize that he is actually a very kind spirit and he really cares for his friends. Personality:She is curious and quiet. She tends to be ignored by many by being too shy. When surprised she tends to squeak and rarely speaks out. If she does it's soft because that way she makes people actually notice what she says. When she meets someone she can be protective of people she cares about but she is not too aggressive. He can be very loyal to his close friends but he rarely trusts anyone straight away so it would be hard to get on his friend level.